Summary: If you haven’t heard of Elon Musk, maybe you’re familiar with the Tesla electric car. Or SpaceX, the company that’s sending reusable rockets to the International Space Station at a fraction of NASA’s cost, and is planning how to colonize Mars. Or maybe you’ve leased some solar panels from SolarCity. All of these companies have Elon Musk as the driving force behind them. A brilliant visionary who grew up in South Africa, Musk emigrated to the U.S as a young man, and made his way to Silicon Valley just in time for the dotcom boom. He got in on the ground floor of PayPal and made a fortune, which he then proceeded to plow back into his companies, determined to create a better, less oil-dependent world. It’s been a roller coaster ride from multimillion dollar fortune to near bankruptcy and back again as Elon Musk dreams of the impossible…and then proceeds to make those dreams come true. 274 pages; grades 5-8. 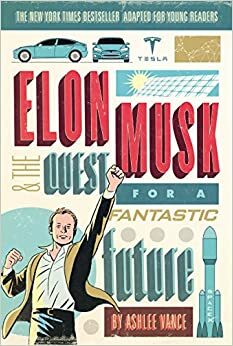 Pros: Musk’s story will inspire technology-loving readers who will be excited to learn it’s possible to save the world and make a lot of money in the process. Cons: I glazed over a bit on some of the more technical descriptions.